Bringing his battle for special status for his state to the national capital, Andhra Pradesh Chief Minister N Chandrababu Naidu on Monday went on a daylong fast that became a rallying point for opposition unity for the second time in less than a month to fight the Bharatiya Janata Party ahead of the Lok Sabha polls. Shiv Sena's Sanjay Raut also made a surprise appearance at Naidu's 'Dharma Porata Deeksha' (day-long protest for justice) that began at 8 am. Raut said he came to attend the event as a representative of the Shiv Sena, amid strains with senior ally BJP. Naidu ended his fast at 8.20 pm, accepting a glass of juice from Janata Dal-Secualr supremo and former prime minister H D Deve Gowda. Congress president Rahul Gandhi, former prime minister Manmohan Singh, Delhi chief minister Arvind Kejriwal, Samajwadi Party founder Mulayam Singh Yadav, Nationalist Congress Party chief Sharad Pawar and Trinamool Congress leader Derek O' Brien were among other opposition leaders who visited Andhra Bhavan to express their solidarity with Naidu, the supremo of Telugu Desam Party. The leaders in their brief speeches mounted a scathing attack on Prime Minister Narendra Modi on a range of issues, notably the Rafale deal, with Kejriwal going to the extent of accusing him of behaving like 'PM of Pakistan' and not of India in the way he treats state governments led by opposition parties. Reacting to Kejriwal's barb, BJP's national secretary and co-incharge for Andhra Pradesh Sunil Deodhar said the leaders of the 'grand-alliance' are competing with each other on who can be more abusive towards Modi. 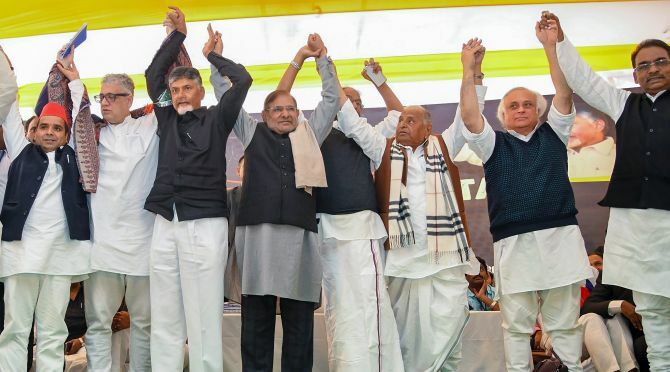 Naidu, who is trying to unite opposition parties, has over the last three months, held a number of meetings with opposition party leaders on forming an anti-BJP front. 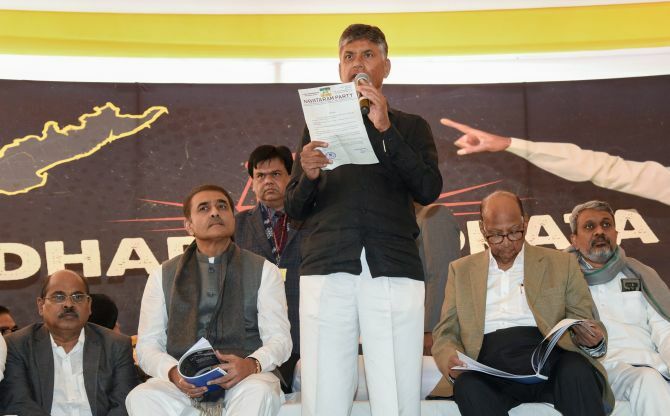 Demanding that the Centre fulfil promises made during Andhra Pradesh's bifurcation in 2014, the TDP president alleged that Modi was not following 'raj dharma' by denying the state special status. "(Former PM) Atal Bihari Vajpayee said 'raj dharma' was not followed in Gujarat (during the 2002 post-Godhra riots). Now, 'raj dharma' is not being followed in the case of Andhra Pradesh. We have been denied what is rightfully ours," Naidu said. He alleged that the central government did grave injustice to Andhra and it would have 'repercussions on national unity'. "On behalf of five crore people, I'm warning this government... I came here to remind you of the promises made in the AP Reorganisation Act." On January 19, 22 opposition parties came together at a rally convened by West Bengal Chief Minister Mamata Banerjee and TMC supremo Mamata Banerjee. 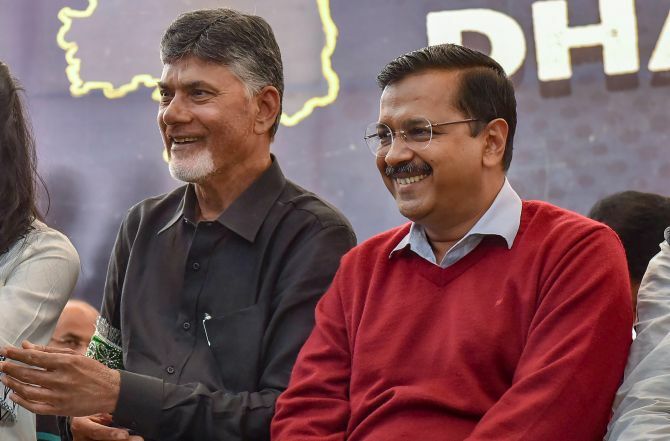 Naidu's fast also came ahead of the mega rally of non-BJP leaders under the aegis of Delhi's ruling Aam Aadmi Party against the Modi government on February 13 in the national capital. Against the backdrop of Naidu's dharna, BJP president Amit Shah wrote an open letter to people of Andhra Pradesh, saying the TDP chief knows that his political fortunes are declining rapidly and is back to theatrics in his desperation for grabbing headlines. Shah accused Naidu of breaking the trust of the people and said he is going too far by 'personally' attacking the prime minister. Naidu's 'delusional politics' is about to end, he said. The TDP leader Sunday dragged Modi's wife while attacking the prime minister. Naidu claimed he had done so as Modi had referred to his son in targeting him at a rally. 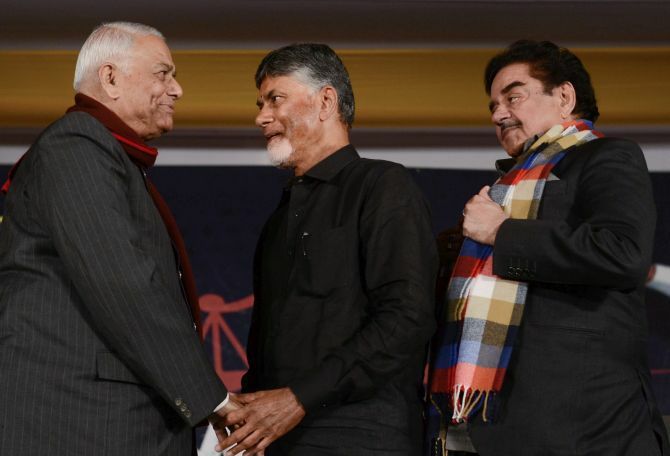 Those who met Naidu also included National Conference chairperson Farooq Abdullah, Nationalist Congress Party's Majeed Memon, Dravida Munnetra Kazhagam's Tiruchi Siva and Loktantrik Janata Dal's Sharad Yadav. No Left leader was present at the protest venue. "The prime minister has stolen from the people from Andhra Pradesh and he has given that money to Anil Ambani. That is the fact of the matter," Gandhi alleged in an apparent reference to the controversial Rafale fighter jet deal with France. "Mr Narendra Modi, wherever he goes, he goes to Andhra Pradesh, he lies about special status. He goes to the North-East, he tells another lie over there. He goes to Maharashtra and he tells another lie over there. He has got absolutely no credibility left," Gandhi alleged. O'Brien recalled Modi's speech in Guntur in Andhra Pradesh on Sunday and said he didn't talk about development or special category status but 'started a personal attack'. 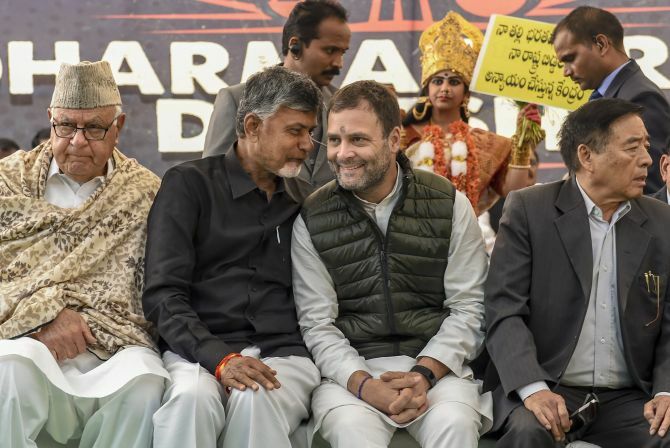 Modi, who was on his first visit to the state after the TDP walked out of the National Democratic Alliance government, came down heavily on Naidu, whom he repeatedly referred to as 'father of N Lokesh'. Lashing out at the prime minister, Abdullah said, "Modi has stooped so low. He's making personal attacks against Naidu, who is doing great service for the country." 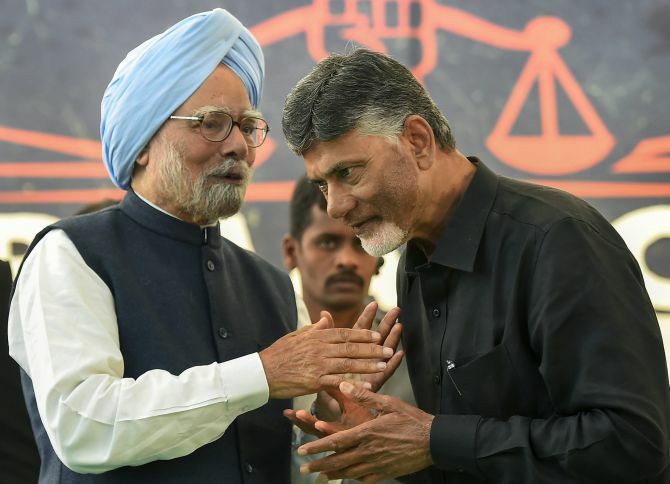 Memon alleged that the Central government was meting out step motherly treatment to Andhra and the BJP was attacking Naidu because he has taken the lead in uniting rival parties against it. Mulayam Singh Yadav said he was not well but had come to endorse Naidu's stand. Stating that Naidu was fighting for a just cause, DMK leader Siva predicted that the Modi government would be ousted in three months. Sharad Yadav blamed the Modi government for unemployment, joblessness which he said were a result of demonetization. "The way PM Modi treats governments of opposition parties in states, he behaves like he is not the PM of India but PM of Pakistan," he said. Andhra Pradesh Chief Minister N Chandrababu Naidu on Monday announced Rs 20 lakh ex gratia for the family of a differently-abled man who had come to the capital to attend his day-long fast but later allegedly committed suicide outside the Andhra Bhavan. Naidu linked the suicide of 40-year-old Davala Arjun Rao to the demand for the Special Category Status for the state, but the Delhi Police said he consumed poison as he was facing financial crisis. The Andhra Pradesh chief minister also announced a state funeral for Rao, a resident of Kinthali village in Srikakulam district of Andhra Pradesh. Addressing the spate of suicides in the state over demands of special status, Naidu appealed to the general public to refrain from taking such steps. "Our problem has become the nation's problem. With all the support we have got today, we have gained in confidence that we are not alone. The people of the state have got demoralised. In this crisis situation, people are committing suicide. Yesterday, a lawyer killed himself and today another did the same," he said. "I want to appeal to everyone that don't commit suicide. It is not good for our society. Don't make your family member orphans. We will fight. We will achieve our goal," he added. Police said Rao killed himself on the intervening night of Sunday and Monday. In the two-page suicide note, Rao cited financial crisis as the reason for taking the extreme step, Verma said. Proceedings have been initiated and further inquiry is in progress, the DCP added. The body has been preserved in a mortuary and will be sent for postmortem after the family reaches Delhi, officials said.